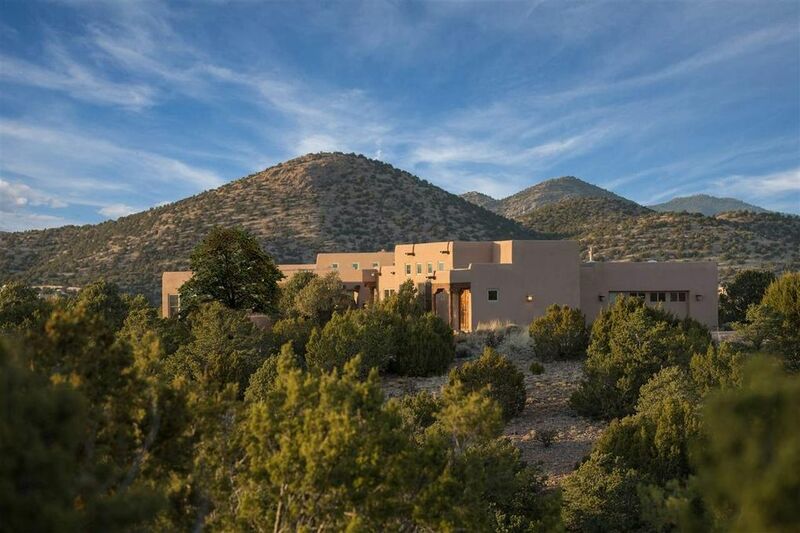 Surrounded by Pinons and situated in the foothills of the Sangre de Cristo Mountains, is this stunning, custom Pueblo-style home, nestled on 10 private heavily treed acres. The moment you enter the property, the vista views of the Galisteo Mesa and silhouettes of the Jemez and Sandia mountains take your breath and the enchantment begins. Its wood beamed, open concept kitchen, dining and living area is centered with a large cozy fireplace, for romantic evenings, while relaxing with a glass of wine, or entertaining friends. The home features many handcrafted details, including views from every window, custom doors and cabinetry, top of the line appliances, an enviable walk-in pantry and Brazilian Cherry hardwood flooring throughout, with stone and tile baths. A state-of-the-art solar array feeds directly back into the grid, so no battery maintenance, just free electricity powering the entire home and the 2 plus car, heated garage contains a self-maintaining whole house water treatment system. At just over 3,000 square feet, this one level home has a generously proportioned master bedroom, with its own fireplace and en-suite, two separate guest rooms and an expansive studio for your artistic or yoga pursuits. Each room has its own private entrance, to a secluded courtyard or wrapping covered portal, with serene mature garden spots, to unwind in. Peace and tranquility in a horse friendly setting, with easy access to amenities and all that and Santa Fe has to offer, can be yours. Directions: 285, Left on Camino Acote to Acote Court.